I have solved some similar hands in the past and if I understand this spot correctly BB is supposed to donk a lot, and if he isn't you need to check almost everything. The river just improves too much of villains range (Ax, FD, sets and even A3 can be in his range). So I think how much he donks is a key part to know when choosing your strategy. April 20, 2019 | 9:31 a.m. If I would bet would not shove but make a thin value bet but then one must be prepared to fold against a raise here so I don't like that either. As far as I can see there is only 60 left in an 80 pot so I don't know if that's much of an option. April 20, 2019 | 9:28 a.m. I think you can give a rec some donk shoves with the flush/FH and they often have a hard time laying down strong absolute hands. If you didn't discount FH in equilab sim it might shift it over to a shove. Recs also usually just 3bet shove a lot of their value hands OTT so his range is probably weighted more towards FD and AQ than a reg but it only slightly adjusts it I think. Remember a lot of recs get so emotional in some of these spots that they're not thinking rationally. It's often just feeling that they should win the pot because they have or had a super strong hand pre/OTF or they're afraid of (...). Here they can be afraid of the flush but then they might just shove turn or they had a "monster" OTF and can't let go. Problem is that they have so many great hands. April 20, 2019 | 9:06 a.m. I'm curious how other people approach this spot. I think I'd default to a more defensive GTO type approach here given it is easy to have bluffs but also difficult to have strong reads. If villain has low ish aggression and high fold after checking I'd overfold but otherwise I think I'd just call my better bluff-catchers amd fold my worse ones. This one seems less than average given it blocks possible offsuit bluffs while K9 only blocks suited ones. April 19, 2019 | 12:21 p.m. Comment | Kalupso commented on [NL10] Semi-Bluff-Raise Turn? It's a turn your range doesn't "allow" many raises because you don't improve to many hands that beats AJ. On top of that your hand just plays way to well as a call. Those two factors combined makes this way better as a call than a raise against any reasonable strategy. April 19, 2019 | 11:51 a.m. I tried to make another sim to model a guy folding too much OTF by solving with 50% pot cbet mixed strategy, changing your strategy to 100% cbet and resolving turn with those ranges.and a slightly larger turn size to model over folding there too. 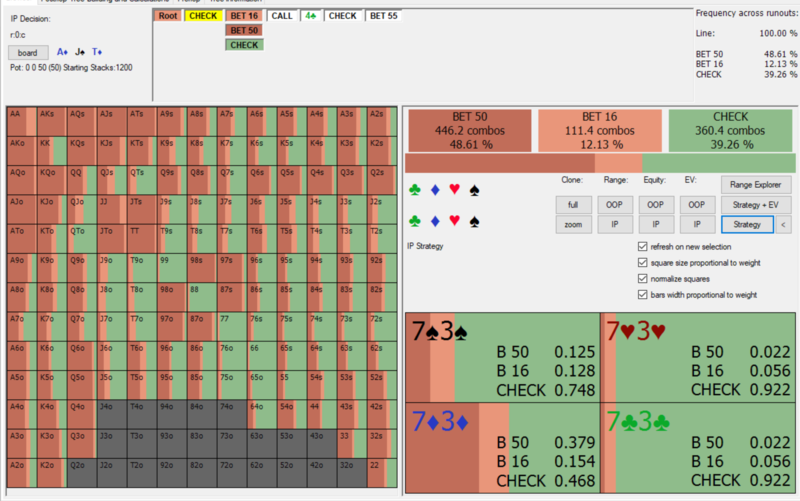 The results are pretty much the same except the weaker 9x hands like Q9 are a tiny bit better as a check in the solver but I didn't take the time to check for what must be true for EV(check) > EV(block) except the equity is a little low to block-bet (went from 70% to 62% in equilibrium vs overfold sim), but you can just lower size to like 17% pot and block is fine. However that kind of accuracy is probably not realistic to operate with in game. I think main take away is that people overfolding doesn't change things that much and that these cards that slightly reduce strength of high frequency value hands, improve many bluffs to good but not great hands and you have both equity and nut advantage are mostly played as just betting a ton. There are a few hands like T7 that works really well as XC hands but those are really low frequency in your range. In practice I don't defend my checking range when I can bet 85% of the time. Also keep in mind that block-bet strategic option is more important than having a check here and EV with block bet and no check is higher than EV without block bet with the option to check. April 18, 2019 | 8:37 a.m. Seems like my idea that you should have almost no checks is supported by my sim (look at frequencies OTR). That sim was with preflop solver ranges and no edits postflop. 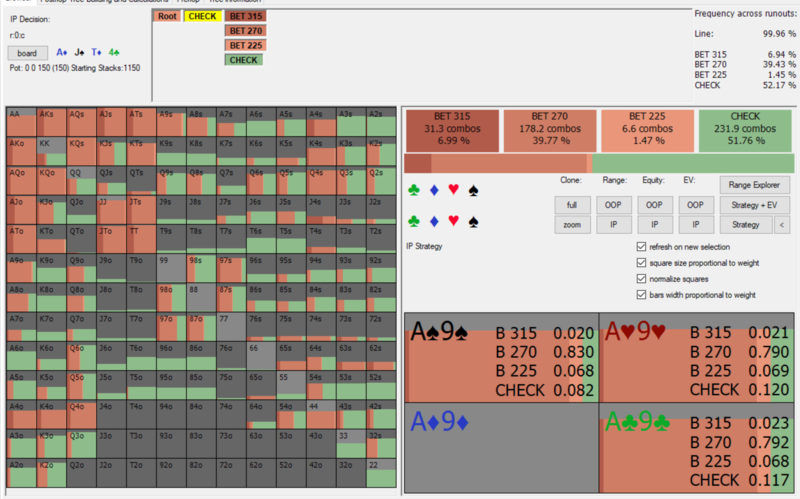 Q9 type hands have around 70% equity in my sim which makes them it a block bet strength hand. Q9 is also the weakest high frequency barrel OTT for value. April 18, 2019 | 8:17 a.m. I prefer to block-bet and fold to raise against passive players. If he isn't floating enough or turning something into a bluff you can't really call bluff-catchers. That being said this hand is too high in both players ranges to XF for me regardless of who I'm playing. Against a BTN flat of 5% you can surely just XF but with ranges being so wide and so little money going in I can't see folding this being good. His tightness kind of works in your favour too given he might not have so much 3x. Maybe he folds A3o, T3s and J3s? Maybe he doesn't float 86 and T8? The he is mostly having A9-Q9 himself and a low frequency of everything else. Without solving this hand and examining ranges it seems like a very good river for your range and a spot you can bet at a really high frequency and not defend your checking range at all. I mean once checking you just XF with bluff that give up. April 18, 2019 | 7:31 a.m.
April 17, 2019 | 8:51 p.m.
Small pairs or is that too loose to bluff flop with BvB? April 12, 2019 | 3:24 p.m.
On my mobile I can double click left side to go 30 seconds back or something, and it's definitely a nice feature. Can skip ahead when they just set up a sim or something too. April 10, 2019 | 4:34 p.m. I made a Pio sim for the hand and included the option to bet 100% pot as well on the flop and Pio seems to put most of the great big betting hands in the 100% pot range, so when it uses 33% pot it cbet turns with the small size more often and going as thin as a medium Jx hand. April 5, 2019 | 11:28 a.m. I used to be more of a HU reg. In HU you 3bet like 75%+ AJo and KQo, 100% TT and like 50% ATo so there are very few nutted hands in BB range. However because of the large amount of KXs and QXs in BBs range that situation will change on any flush complete K or Q river so around 15 of 48 rivers. I wouldn't be surprised if it is good to use something like a 200% pot cbet with TT, JJ and KQ and something like 120% pot with something like A9+. It just seems quite important to get a lot of money in now with so many good rivers for BB in a spot BB is extremely far behind. April 5, 2019 | 11:06 a.m.
To put things into perspective I don't 3bet less than 5% against any position in 6max except for when in BB vs 16% RFI or something. I'm a bit on the aggressive side and my overall 3bet frequency is around 12% to 13% and it seems to work really well. Around 23% 3bet BB vs SB and like 15% BTN vs CO drags it up a little. Population I play against 4bet too little and fold way too much to postflop barrels so those extra 3bets just print money. April 5, 2019 | 9:17 a.m. I wouldn't fold flop as there are some possible one and done bluff and he can raise worse for value/merge. I'm more concerned about your preflop play though if that's your real stats. It's quite tight-passive compared to what is likely most profitable. April 5, 2019 | 8:09 a.m. Comment | Kalupso commented on Performing at a high level during long periods? I know a lot of people try to anticipate the next move and have the play ready for scenarios x, y, z... Looks at hands just played and tries spot spot mistakes or even check tracker after losing a few pots. All of those are examples of not being present in the moment and takes away energy. Instead you could just sit calmly and take a few breaths until next decision comes up. Stay in the present, let the decisions come to you and refill your energy between hands..
March 29, 2019 | 8:01 a.m. Suggestion: Lower HU and shorthanded rake considerably to reward starting tables. I mean the percentage. I'd be much more happy to play random regs for a while if rake was 2,5% or something. March 28, 2019 | 5:54 p.m. Comment | Kalupso commented on Question on how to collect rake. This can be improved upon by adding antes. March 26, 2019 | 8:39 p.m.
SNGs and MTTs do have a fixed fee. March 23, 2019 | 6:51 a.m.
Preflop solvers 4bet very aggressively in games with high rake and calls very little OOP.. It's a huge leak not to 4bet OOP and IP you want to 4bet premiums against fish because they call too much. IP 4bet isn't that important against a passive micro stakes reg that 3bet 5% or something. March 22, 2019 | 12:39 p.m.
Yeah, forcing it does not get you very far. "In the pursuit of learning, every day something is acquired. March 15, 2019 | 1:30 p.m. I mean QTs is a very clear fold regardless for what SB is doing. It would also be a clear fold if he didn't call. March 14, 2019 | 2:53 p.m. Comment | Kalupso commented on [50NLz] River Calling Efficiency of 1.5 good or not ? It's one of those stats that don't make sense without taking other stats into account. 1.0 or lower is definitely a leak. When you have the nuts and call an all-in will also increase it above one. If you have low WTSD and very high RCE you're probably passing up +EV river bluff catches. Also if you XC river instead of betting good value betting hands that are not strong enough to XR you will increase RCE but lower your win rate. Don't really want to take this further and I think you can figure out on your own other ways RCE can be skewed in different ways without making your win rate higher. March 14, 2019 | 12:15 p.m. I'd fold preflop with QTs and I don't think it's close. AKo, KQs, KJs, ATs+ and pocket pairs are pretty much the only hands good enough to be close and even some of those might be folds if CO is tight or passive enough preflop. I think having a QJs, JTs type hand might not be so good MW because going all in with 3rd or 4th nut FD OTF MW is often a bad idea. When pot is already so big and continuing range so tight it's often fine to only continue by making 4bets. You can split your range into a small 4bet and a 4bet shove range. 4bet shove will be mostly hands like AKs, KK and QQ. While small 4bet will mostly be AA, AKo, AQs, AJs, KQs, JJ with some KK, QQ and TT type hands. I haven't worked on these spots in a while so accuracy of how to split range is not on point but I think you get the idea. Snowie will be way off here and it probably assumes SB flats hands like AKo, AKs, AQs, QQ, KK and AA which are the only hands that are close to strong enough to be played for SB there. Edit: 4bet shove seems to be between 4x and 5x pot so it's a little deep to do much shoving.The idea of mostly continuing as 4bet still stands but you don't split into shove and small 4bet. March 14, 2019 | 10:04 a.m. Comment | Kalupso commented on Do you think a 3bet of fold strategy is good? The required aggression to slowplay is higher than you might think and one aggressive player 3betting 14% or something probably isn't enough. You'll also end up with a strategy where you 3bet medium-good hands and flat your top one. That's fundamentally a weak strategy so you probably lose more on average than what you gain back if read is correct. March 14, 2019 | 9:52 a.m.
Nice pack. I saw you omitted flop 3bet IP in SRP. It seems like a reasonable simplification and it's a line I never got into learning. Is there any boards you found it more important to have a flop 3bet IP? March 13, 2019 | 5:04 p.m. Comment | Kalupso commented on [50NLz] KQo flopping top pair on KJJ board and villain bets out ? Texture has 3 cards between T and A which means almost every hand in CO range is a pair. Therefore bluffing frequency is likely to be on the lower side regardless of CO's tendencies and you can happily make a tight fold. March 7, 2019 | 8:01 p.m. Comment | Kalupso commented on Can you get away from set over set? Is that still a thing in 2019? March 5, 2019 | 1:17 p.m.
March 4, 2019 | 8:50 a.m. Check out Matthew Jandas latest book. There isn't super easy answers for how to use conclusions in improving your strategy in game. March 3, 2019 | 2:53 p.m.